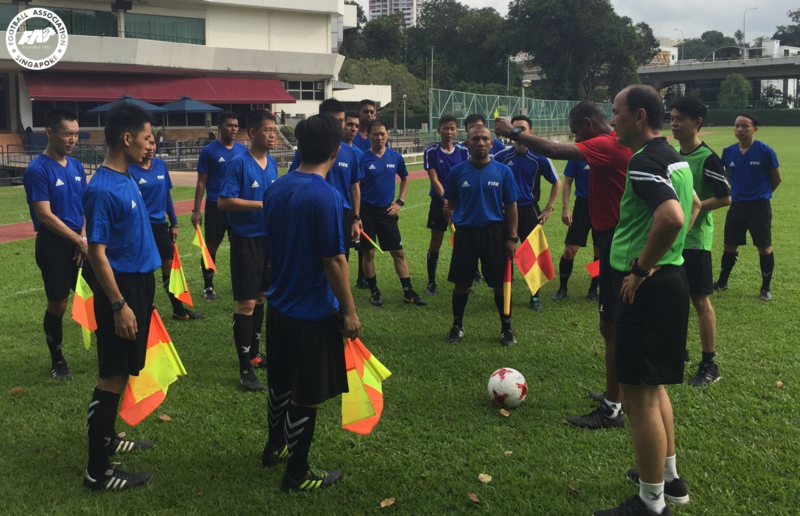 SINGAPORE, 7 AUGUST 2018: Thirty referees officiating in the Singapore Premier League attended the FIFA/Football Association of Singapore (FAS) Referees Seminar 2018 conducted by FIFA Referee Instructors Subkhiddin Mohd Salleh and Ganesan s/o Maniam, as well as local instructors. The four-day seminar, which took place from 2 to 5 August, was organised by the FAS to update local referees on the latest amendments made to the Laws of the Game and instil modern refereeing concept in them. Apart from spending time in the classroom, practical sessions were also held – with the help of the FAS Football Academy Under-17 and Under-18 boys – to create scenarios to hone the referees’ decision-making skills in areas like offside situations. In his opening address, FAS President Lim Kia Tong said: “I am pleased with the Referees’ Committee exploring various initiatives aimed at leveling up the refereeing standards in Singapore. Match officials are pivotal in the football eco-system as they perform a vital role in a football match with their split-second decisions. With the media attention and coverage of football matches, they are constantly scrutinised for every decision made. Thus, expectations on the match officials are immensely demanding in every aspect of the game. 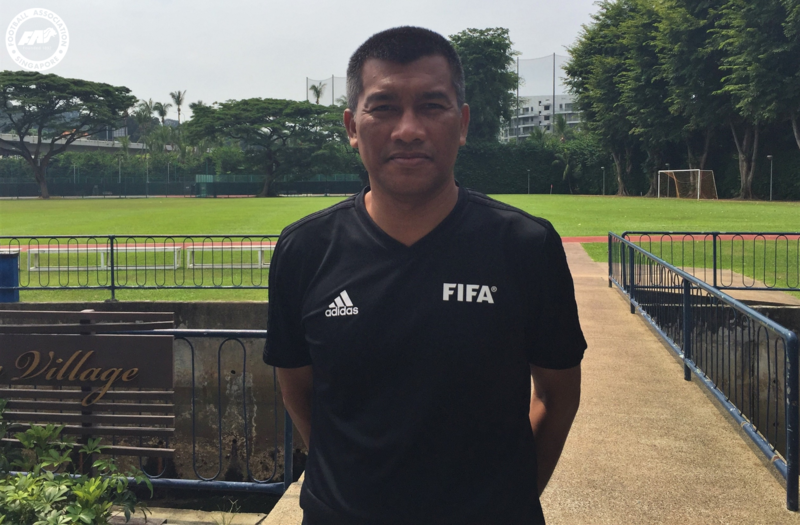 An experienced FIFA and AFC Elite referee, Subkhiddin commented: “I have been following up and watching Singapore’s football matches to see how the referees perform. I can see that Singapore referees have a good character and look mature during the game. They allow teams to play and stop when they reach certain limits (in order) to protect the safety of players. This is what we need in football. Subkhiddin was appointed as the Referee’s Technical Instructor for the 2018 FIFA World Cup Russia, where he was tasked to plan the referees’ preparations from a technical aspect, analyse their performances and provide technical explanations to the players and team officials. He had also previously officiated as a referee for the 2007 FIFA U-20 World Cup in Canada and as the fourth official in the 2010 FIFA World Cup in South Africa. With Subkhiddin’s knowledge and expertise, Acting Head of the FAS Referees Department, Nazeer Hussain, believes that local referees can benefit from the seminar. “Subkhiddin has been a FIFA Instructor for a very long time,” he said “His appointment as a technical instructor in Russia for the World Cup 2018 speaks very highly of his expertise in this field. Nathan Chan, who has been refereeing since 2009, added: “The seminar was very useful in keeping us updated with the changes in the Laws of the Game, and creating uniformity in the interpretation of the Laws. It also provided a platform for referees to interact, enhance teamwork as well as understanding,which can be translated onto the field of play. The FAS would like to thank Subkhiddin for taking the time to share his knowledge and experience with our referees. We will continue to look at various ways and initiatives to enhance our referees’ expertise in future.